On any given day, countless images are used all over the internet, many of which are stolen. Studies by IMGembed and Copytrack show that of the three billion images shared online each day, around 85% are unlicensed. That’s a total of around 2.5 billion stolen images! Many users don’t know that the use of others’ images is often a violation of copyright law. Often times, even the very artists, photographers, picture agencies, and other rightsholders who are adversely affected are unaware of the consequences of image theft. The truth of the matter is that it puts these rightsholders at a disadvantage by causing them to miss out on considerable revenues. In total, the estimated revenue lost as a result of image theft can reach up to 536.5 billion Euros daily! Adding insult to injury, the ubiquity of image theft hints at a widespread lack of respect for the work of photographers. To raise awareness for the magnitude of online image theft, Copytrack regularly investigates where and how most cases of online image theft take place. ► We’ve prepared the Copytrack Global Infringement Report 2019 with the help of our proprietary website crawlers that track illegal image use. To conduct the report, we ran statistical analyses on more than 12,000 Copytrack user profiles. 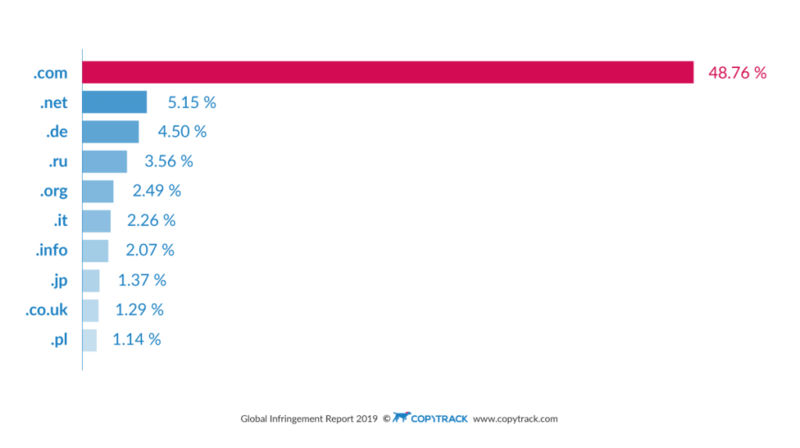 The Copytrack Global Infringement Report summarizes these results. The percent values relate to the share of potential infringement cases collected between December 2017 and December 2018. 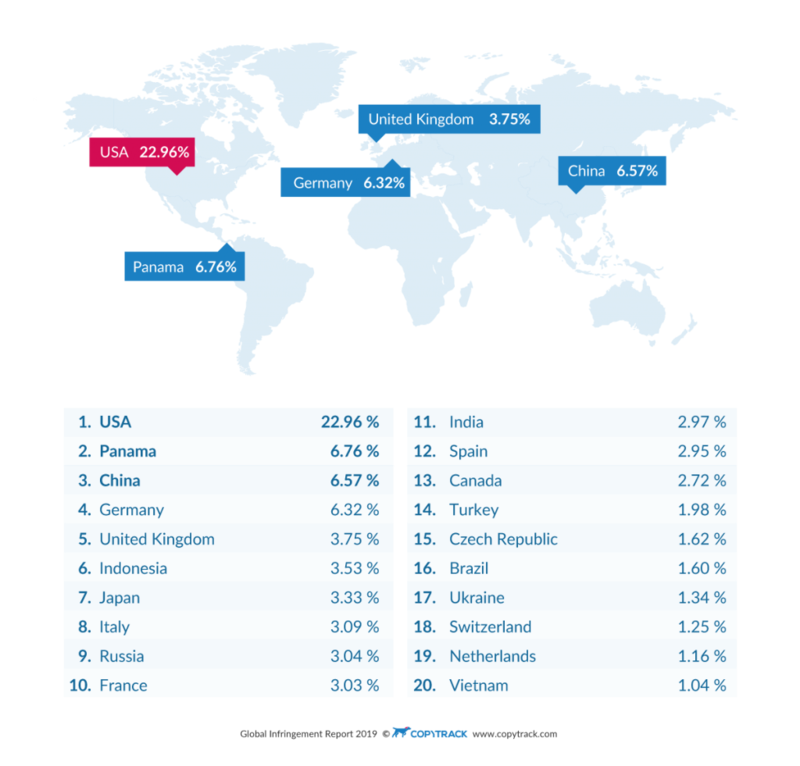 A country-level comparison reveals that the US is the world leader in image theft with 22.96 percent of all hits worldwide. This comes as no surprise, given the size of the country and the sheer number of websites that operate there. Less obvious, however, is that Panama, a country with just four million inhabitants, comes in second with 6.76 percent. Why, you may ask? This anomaly is likely the result of Privacy Protection Services, a provider that registers third-party domains to Panama to mask the real owners’ personal information. China, considered by many to be the world leader in copying, comes in third place with a surprisingly small 6.57 percent – unexpected considering China boasts a population three times the size of that of the USA. ► And what about Germany? With 6.32 percent of illegal hits, Germany closely trails Panama and China. This further confirms the theory that there is a weak general appreciation for the implications of image theft in Germany. The following six on the top 10 list of most image infringing countries each clock in a little above 3 percent. This includes the United Kingdom with 3.75 percent, Indonesia, Japan, Italy, Russia, and, at the bottom of the list, France with 3.03 percent. 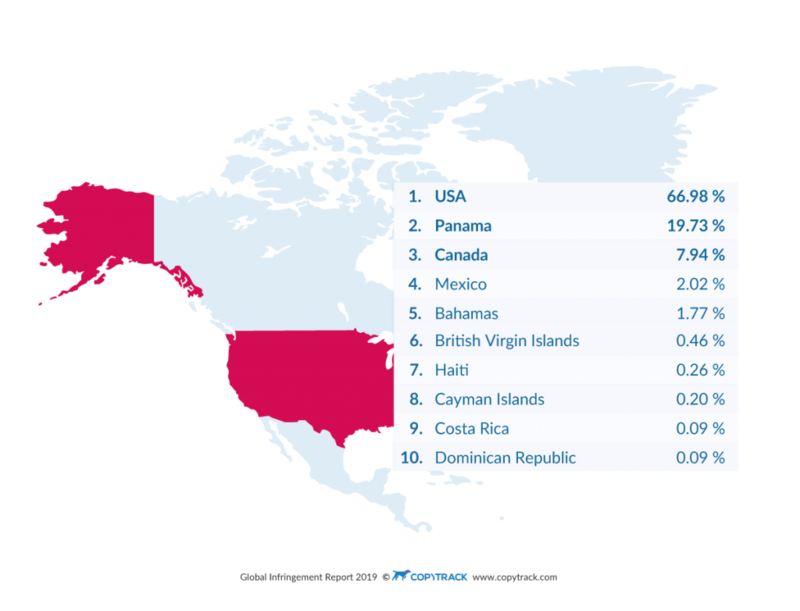 While we already know that the USA is leading in image copyright infringement violations in all of North America, what is surprising is that the USA was responsible for about two-thirds (66.98 percent) of Copytrack’s search hits. Number two in the infringing countries list, Panama, followed with 19.73 percent of image copyright violations in North America, while Canada took third place with 7.94 percent. In other North American countries, the illegal use of images didn’t seem to be very widespread. Mexico was responsible for a mere 2.02 percent of illegal findings, while the Dominican Republic and Costa Rica rounded out the bottom of the group with 0.09 percent each. Which Image Resolutions are Most Likely to be Stolen? We also analyzed a year’s worth of hits by image size and one thing became clear – formats being used are dictated by their intended purpose and display device. Accordingly, our database is chock-full of diverse image resolutions and there are thousands of different formats being used. Over the duration of our study we registered hits with 22,676 different image resolutions. 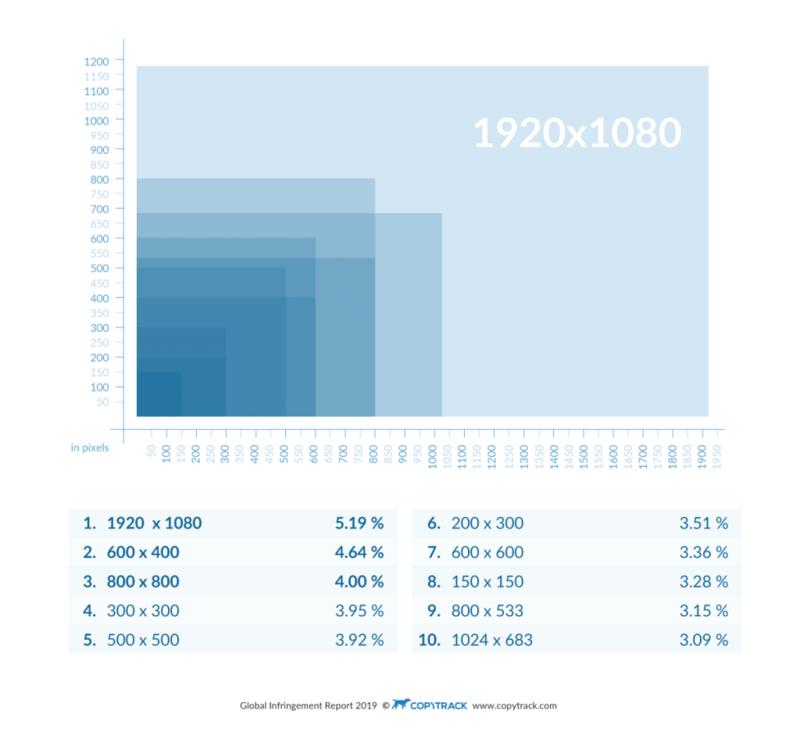 The most common size used for unlicensed images is 1920 x 1080 – full HD format. Users often select this format when the screen needs to be filled, for things such as wallpapers and large photo galleries. The remaining top 10 image resolutions were considerably smaller. The most commonly used formats are 3:2 (or 2:3) and 1:1. Images sized 600 x 400 pixels, the second most common image resolution we found, are often used to break up larger blocks of text in articles and blogs. Strangely, the image resolution 800 x 800 pixels comes in third place. Since mobile phones and computer monitors generally use wide screens, larger images are usually either wider (landscape mode) or taller (portrait mode). The 1:1 format is often used for small product previews and avatars, though 800 x 800 pixels seems quite large for this purpose. The Copytrack Global Infringement Report 2019 concludes with an analysis of top-level domains – the letters that comes after the period. Our analysis includes 505 different top-level domains in total. Domains that end in .com are extremely popular among companies and individuals throughout the world and there are no geographic restrictions imposed at registration. Accordingly, it’s no surprise that this domain comes in first place with 48.76 percent of all unlicensed image use. 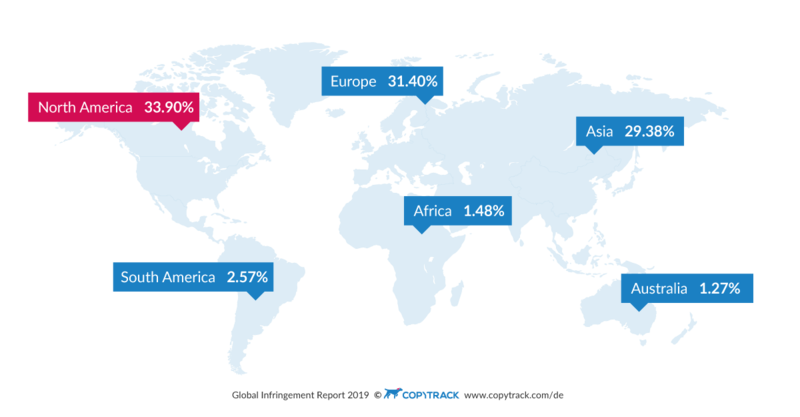 Following a large gap, the .net domain, which is also used internationally, takes second place. It’s not until third place that we arrive at a domain that we can link to a geographic location – Germany’s .de domain. It is followed by a mix of international and local domains, specifically .ru (Russia), .org (the domain used for organizations), .it (Italy), .info, .jp (Japan), .co.uk (United Kingdom) and, in tenth place, the top-level domain used in Poland, .pl. The Copytrack Global Infringement Report 2019 shows that photographs and pictures are used illicitly and at a massive scale in nearly every country on earth. Despite increased efforts by Google, Yahoo and the like to reliably identify rightsholders, the problem is expected to persist. Luckily photographers and other rightsholders can still file claims for fair compensation even after image theft has taken place. Copytrack’s service exists for this very reason and helps rightsholders enforce their image rights without the need for substantial effort or financial risk. Have we piqued your interest about which cities produce the most infringement cases? Would you like a breakdown of image theft in individual continents and countries? PrevPreviousCreative Commons Licenses: What Are the Rules for Royalty-Free Images?